One of the largest and highest ski areas in the region, actually based on three original villages spread out along three miles of road. Excellent intermediate skiing, and very close to St Moritz, also famous for being duty free, due to its historical remoteness. There are over 200 shops, mostly selling alcohol, cigarettes and perfume. 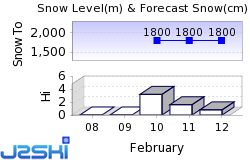 The next notable snow forecast for Livigno is 8cm3in, expected on 24 April, with around 56cm22in forecast over the next 7 days. The Italian Ski Resort of Livigno is part of the Alta Valtellina ski area with access to 184km114 miles of downhill skiing, with 112 marked pistes, served by a total of 62 ski lifts. In addition to the skiing in Livigno itself (110km68 miles of pisted ski runs), the appropriate ski Lift Pass will allow you to ski or snowboard in the other Alta Valtellina ski resorts of Bormio and Santa Caterina. The ski resort itself is at 1,820m5,971ft, so skiing or boarding back to the resort is usually possible. With ski lifts as high as 3,000m9,843ft, skiing and snowboarding is assured throughout the season. One of the highest genuine villages in Europe, Livigno is able to offer skiers natural snow skiing from November to May. It is situated in what was a remote mountain valley between the Alps to the north and the Dolomites to the south - protected from both the cold northerly winds of the former and the snow-melting warm breezes of the latter. It is located just south of the Swiss border, with St Moritz one of it nearest neighbours. The resort is famous because it is 'duty free' and contains over 200 shops - most of them selling alcohol, tobacco and perfume products at tax free prices. The ski area is very big for a single resort and has a modern, efficient lift system. The resort is actually based on three older villages and stretches for 8km (5 miles) along the road with various access points to the skiing along this length and the hundreds of small-medium sized shops, hotels and apartments filling almost all available space. The resort's duty free status is really just a by product of its long struggle for an independent identity which was recognised as far back as 1600 when the local people were granted economic and religious independence. At that time the village was virtually cut off from the rest of the world for much of the year. This special status has been reinforced over the years by the various national rulers, including Napoleon in 1805, the Austro-Hungarian empire, in control in 1818, and most recently by the European Community in 1960. One of the later arrivals on the winter sports map because of its isolation, only intrepid visitors arrived by sledge in the snowy months before 1952 when the road down to Bormio was opened. The first ski lift appeared as recently as 1958 and in 1964 there were just four hotels and still only one ski lift. Today there are more than 100 hotels and other places to stay. The longest possible descent in Livigno is 4km2 miles long and the most difficult run is the 'Giorgio Rocca'. A good choice for beginners wanting to have fun, about half of Livigno's lifts are surface drags running parallel to one another along the length of the village over the sunny meadows which nonetheless remain snowsure thanks to Livigno's height. Much of the terrain higher up is intermediate standard but the wide smooth, sunny slopes here can normally be tackled by beginners by the end of their first week. There are in fact six ski areas around the long village, although most are lift linked to one another anyway. The ski area is, however, split in two by the village itself. On one side, the toughest skiing is accessed by the Mottolino gondola and ultimately rises up to 2785 metres at Monte Della Neve from which the resort's two blacks descend back towards the tree line. The larger skiing sector is accessed by the two stage Carosello 3000 ski centre from the southern end of the village or by a series of chair lifts from the village centre. It is a centre of wide smooth trails well above the treeline and classified red, which will delight intermediates. Back in Livigno the area of Trepalle, beneath Monte Della Neve, is particularly appealing to off piste skiers and 'boarders, telemarkers and ski tourers. It's Europe's highest permanently inhabited parish between 1900 and 2250 metres and is an area of immense peace and splendour throughout the year. Cross country skiers have 40km of trail around the sunny valley and there's a famous international cross-country race, the Sgambeda, a few days before Christmas each year. Livigno's low prices and party atmosphere naturally attract the 'boarding crowd and, with almost all of the higher terrain served by chair lifts and gondola, it's 'boarder friendly on the slopes too. Although some of Livigno's terrain is off-limits to 'boarders, some 70km (43 miles) of runs are accessible and suited to all standards. There is one half pipe on the Mottolino side where there's also a fun park with jumps. The resort also boasts two boardercross courses. We don't currently have confirmed season dates for Livigno. NOTE:- Lift and Piste openings are always subject to Snow Conditions in Livigno. Livigno is able to make snow, on 82km51 miles of ski runs, with 136 snow cannons. The 31 ski lifts of Livigno are able to uplift 46,460 skiers and snowboarders every hour. Livigno is in the Italian Alps in Alta Valtellina, Lombardy, Italy. The nearest airports to Livigno are Bolzano, St. Gallen-Altenrhein and Innsbruck Airport, all within three hours drive. The Webcams in Livigno are not always up-to-date. Please check the date on the image to ensure you are seeing current snow conditions. A good choice for anyone in search of the elusive - good skiing and good night-life mixture, with the even more unlikely and not too expensive rider, Livigno's duty free status extends to the buzzing bar scene where affordable fun cocktails are often the order of the day. There's a huge choice of establishments including video bars like Marco's, karaoke joints like Bivio, and discothèques like the very Italian Cielo and Kokodi. A full program of events is organised throughout the season including ice scuplute displays and classical music concerts. Other Ski Areas within Alta Valtellina. Other popular Ski Areas near Livigno. Want to ask about skiing and snowboarding in Livigno? Or contact Livigno Tourist Office. Note :- The information on J2Ski concerning Livigno, where not clearly factual, is opinion only and is neither definitive or exhaustive.